Tiwari P*, Chauhan AR **. Uterine fibroids are increasingly common in pregnancy and their management in the antenatal and intrapartum period is challenging for the obstetrician. Large fibroids during labor pose a difficulty, and depending on the location and problems with labor, majority of these cases require cesarean section. 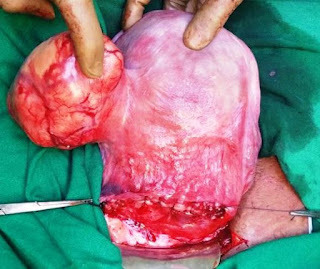 We report a case of large pedunculated fibroid with twin pregnancy where myomectomy was performed at cesarean section, and discuss the controversy of cesarean myomectomy. The reported prevalence of uterine fibroids in pregnancy is between 2- 5 %, but is on the rise and reported to be as high as 12-25 % in older women, especially those undergoing treatment for infertility. [1-3] Fibroids are usually asymptomatic during pregnancy but may be associated by degenerative changes typically the red degeneration; its effects on pregnancy are spontaneous abortion, preterm labor, preterm premature rupture of membranes, antepartum hemorrhage, malpresentations, in-coordinate uterine activity, postpartum hemorrhage and operative delivery. The management of uterine fibroids during pregnancy is mainly conservative (or symptomatic) and its definitive management (myomectomy) is often performed after the delivery of the fetus. Previously, obstetricians avoided myomectomies during cesarean section (CS) as the procedure was associated with severe hemorrhage because of the increased blood supply due to pregnancy; probably the only exception is a pedunculated fibroid. [4,5] Hence in majority of the cases the myomectomy is performed after the puerperal period. Cesarean myomectomy has always been a controversial topic, with two schools of thought; some obstetricians advise to perform elective myomectomy during CS and some are against it. Here, we report a case of a cesarean myomectomy in a patient with twin pregnancy. Mrs. JD, 27 year old primigravida, with spontaneous conception, registered at 8 weeks gestation, at which time ultrasonography (USG) showed twin gestation with a single fibroid in the right lower segment, approximately 4 x 5 cm in size. Subsequent serial scans confirmed diamniotic dichorionic twins and showed marked increase in the size of the fibroid, to the present size of 10 x 12 cm, along with upward “migration” as the pregnancy advanced. Patient also had 2 previous episodes of severe localized abdominal pain associated with the fibroid,, for which she had been hospitalized around 28 weeks of pregnancy. All routine antenatal investigations were normal. She presented at 37 weeks 5 days of gestation, with breech - vertex presentation with leaking per vaginum (PV). On examination, her pulse was 84 beats/min, her BP was 120/80 mm of Hg. On abdominal examination, uterus was over-distended, 40 weeks in size, relaxed, with twins in breech-vertex presentation with normal fetal heart sounds of both fetuses. 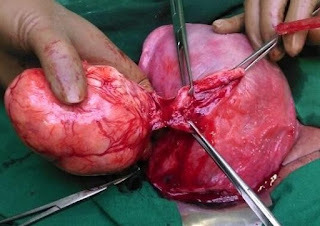 The large fibroid was separately palpated in the right fundal area, approximately 10 cm in size, and was mildly tender. On per vaginal examination, the cervix was 1 cm dilated, 40% effaced, with leaking PV with breech-vertex presentation and the pelvis adequate. Her hemoglobin was 11.7 g/dL and her blood group was AB positive. The patient was taken for an emergency CS in view of twin pregnancy with first twin in breech presentation and leaking PV. The option of myomectomy at CS had been previously discussed in the antenatal period and in fact the patient had requested the same; she was counseled again when she presented with leaking PV and her consent was obtained preoperatively. Two units of blood were cross matched and kept ready. During the cesarean section, a subserous penduculated fibroid of size 10 x 12 cm was noticed on the right anterior fundal wall of the uterus. Lower segment cesarean section was performed, both live male neonates with a weight of 1.95 kg and 2.4 kg were delivered. Both neonates had an Apgar score of 8 and 10 at 1 and 5 minutes respectively. Placenta with membranes was also delivered completely. After closing the lower segment, a decision was taken to perform myomectomy. The fibroid was removed using electrocautery and the pedicle was clamped and sutured without difficulty in 2 layers using polyglactin No. 1 for the first layer and No. 2-0 for the serosal layer. Complete hemostasis was achieved. The fibroid was sent for histopathological examination. Oxytocin drip was started after the delivery of the babies and was continued for first 4 hours postpartum. No other uterotonics or blood transfusion were required; there was no intraoperative complication or increased blood loss. Her postoperative recovery was uneventful and repeat hemoglobin was 10.6 gm%. Histopathology report showed benign fibroid with hyaline and myxoid degeneration. She was discharged on the fifth postoperative day in a hemodynamically stable condition. Figure 1. Subserosal pedunculated fibroid on right anterior wall of the uterus. Figure 2. Cutting of the fibroid pedicle after closure of the lower uterine segment. Uterine fibroids are being observed in pregnancy more frequently now than in the past, mainly because of the following factors: improved knowledge and research in the field, late age of pregnancy, assisted reproductive techniques which help women with fibroids to conceive, and availability of advanced diagnostic techniques like USG and magnetic resonance imaging.. Cesarean myomectomy is a topic of debate and dilemma for many obstetricians, and the main reason not to perform it is the risk of massive hemorrhage and other morbidity associated with it. Ehigieba et al in their study of 25 cases of cesarean myomectomy performed on 12 women concluded that anemia was the most common form of morbidity. Kwawukume performed cesarean myomectomy in 12 women and reached to the conclusion that it is easy to perform myomectomy in gravid uterus as the pseudocapsule is relatively loosely attached as compared to the non-pregnant uterus. Li carried out a retrospective study to assess the effectiveness of the safety, complications and the outcomes of myomectomies which were done during CS, and found that cesarean myomectomy was a safe and effective procedure. Similarly, Hassiakos reported that the associated risks of cesarean myomectomy were similar to CS without myomectomy. In a retrospective study, Kaymak compared 40 patients who underwent cesarean myomectomy with 80 patients having fibroids who had undergone CS without myomectomy, and reported non-significant difference in the incidence of hemorrhage, 12.5% and 11.3 % in the two groups respectively. The most significant predictors of success of cesarean myomectomy include age, surgical experience and type of fibroids. Rarely intramural and multiple fibroids in the lower uterine segment which may interfere with delivery of the baby have to be removed and may be attended with hemorrhage; controversy still exists about the best method to tackle these fibroids. However, in women who have subserosal pedunculated myomas, as in our case, cesarean myomectomy by an experienced surgeon is a safe procedure and should be performed. Practice Committee of the American Society for Reproductive Medicine. Definitions of infertility and recurrent pregnancy loss. Fertil Steril. 2008; 89(6):1603. Vergani P, Locatelli A, Ghidini A, Andreani M, Sala F, Pezzullo JC. Large uterine leiomyomata and risk of cesarean delivery. Obstet Gynecol 2007;109 (2 Pt 1):410-4. Klatsky PC, Tran ND, Caughey AB, Fujimoto VY. Fibroids and reproductive outcomes: a systematic literature review from conception to delivery. Am J Obstet Gynecol. 2008;198(4):357–366. Celal K, Hülya C. The evaluation of myomectomies performed during cesarean section in our clinic. Niger Med J. 2011; 52(3):186-88. Kwon DH, Song JE, Yoon KR, Lee KY. The safety of cesarean myomectomy in women with large myomas. Obstet Gynecol Sci. 2014; 57(5): 367-72. Song D, Zhang W, Chames MC, Guo J. Myomectomy during cesarean delivery. Int J Gynaecol Obstet. 2013; 121(3): 208-13. Ehigiegba AE, Ande AB, Ojobo SI. Myomectomy during cesarean section. Int J Gynaecol Obstet. 2001; 75(1): 21-25. Kwawukume EY. Myomectomy during cesarean section. Int J Gynecol Obstet. 2002; 76(2):183-84. Li H, Du J, Jin L, Shi Z, Liu M. Myomectomy during cesarean section. Obstetrical and Gynecological Survey. 2009; 64(6): 363-64. Hassiakos D, Christopoulos P, Vitoratos N, Xarchoulakou E, Vaggos G, Papadias K. Myomectomy during cesarean section: a safe procedure? Ann N Y Acad Sci. 2006 Dec; 1092: 408-13. Kaymak O, Ustunyurt E, Okyay RE, Kalyoncu S, Mollamahmutoglu L. Myomectomy during cesarean section. Int J Gynaecol Obstet. 2005; 89(2): 90-93.